The Best SME blogs from thousands of top SME blogs in our index using search and social metrics. Data will be refreshed once a week. 2.38 Generate Accounting | Ponsonby Accountants. SME newsletter is a comprehensive summary of the day's most important blog posts and news articles from the best SME websites on the web, and delivered to your email inbox each morning. To subscribe, simply provide us with your email address. Sydney About Blog For small to medium-sized business owners who are dissatisfied with their lack of results or who simply want to accelerate growth. We specialize in educating, training and supporting business owners to identify, plan and manage your marketing, sales and strategic planning in order to grow your business fast. Get articles by Kerwin Rae on topics relevant to small to medium sized businesses helping them implement strategies to become successful. Facebook fans 885,996. Twitter followers 6,485. About Blog SMB CEO small business blog offers resources and knowledge for the small business CEO. Facebook fans 524. Twitter followers 729. Naples, FL About Blog Founded in 2003, Small Business Trends is an award-winning online publication for small business owners, entrepreneurs and the people who interact with them. It is one of the most popular independent small business publications on the web. Small Business Trends brings original news, information and resources to entrepreneurs, owners and managers. Facebook fans 63,558. Twitter followers 142,594. South East Asia About Blog Noobpreneur.com is an authoritative small business online magazine, dedicated to cover the latest tips, news, ideas and tools for small business owners. Facebook fans 8,944. Twitter followers 4,420. Facebook fans 1,839. Twitter followers 40,407. London About Blog Real Business is one of the longest running business publication for SMEs.Launched in 1997 as a monthly print magazine, our mission was "for entrepreneurs by entrepreneurs. "Now, 21 years on, we believe in telling the truth about SME life. Our mission is to the tell the truth about SME life, & we do this by inspiring and informing our readers on the latest news & views in the UK business world, sharing business success & failures, as well as starting conversations and encouraging healthy debate. Facebook fans 3,336. Twitter followers 40,409. Redwood Shores, CA About Blog Tailored solutions for small- and medium-sized businesses. A resource for the latest in technology, innovation and entrepreneurship. Your growing business demands speed, scale & agility. There's no place for slow and steady. That's why we're in the Business of GO. In this publication, we'll provide advice to help propel your business forward. Facebook fans 1,889,353. Twitter followers 1,803. London, UK About Blog SME Web is the website for SME business coverage produced by Publications UK. We bring you content from around the web which is relevant for you and tell you what it means for your business. SME brings you news stories, features and expert blogs examining the key issues affecting your small or medium-sized business. Facebook fans 3,667. Twitter followers 2,982. USA | UK | Asia | Australia About Blog ZDNet covers the latest SMB trends, from e-commerce technologies to cost-effective applications, hardware, collaboration tools and cloud services. Facebook fans 271,573. Twitter followers 441,396. Mountain View, CA About Blog Comprehensive up-to-date coverage for SME's, aggregated from news sources all over the world by Google News. Facebook fans n/a. Twitter followers 215,649. Austin, TX About Blog Volusion is more than just an ecommerce solution, it’s an online store builder with a dedicated team of developers, marketers, designers and technical support gurus that are passionate about helping merchants manage their stores. Volusion’s Blog is a helpful resource for entrepreneurs, small business owners and ecommerce marketers. Learn how to increase conversions & attract traffic. Facebook fans 56,903. Twitter followers 37,573. India About Blog Zee Business provides the latest news for small businesses, SME and start up companies. Find top small business headlines, trends, tips, advice, updates about small business in India such as entrepreneurs, venture capital, jobs, start-ups & small business opportunities. Facebook fans 1,049,165. Twitter followers 110,252. Chicago, IL About Blog UpCity’s inbound marketing blog provides weekly & monthly news, guides, and educational resources on a variety of topics that influence SMB digital marketing. They aim to focus their content to be accessible to a wide audience that ranges from beginners and novices in digital marketing, to agency owners and decision makers looking to further their skill set and education. Facebook fans 1,063. Twitter followers 6,626. Worldwide About Blog Recruiting for a growing organization is a challenging task, with a unique set of problems that often one or two people are tasked with solving. Blogs in this category cover topics related to hiring for small businesses, recruiting on a budget, using Indeed tools, tutorials and other tips for reaching SMB success. Facebook fans 1,378,671. Twitter followers 231,337. Worldwide About Blog Our Content Marketing Hub shares real examples of how brands and SMBs achieve results through content. Read more on Outbrain's blog. Facebook fans 115,915. Twitter followers 22,060. South Africa About Blog Sage specialises in accounting and business management software development aimed at small and medium sized business, although we do offer expertise and business solutions for larger businesses. We give businesses the information, insight and tools they need to succeed today. Facebook fans 702,532. Twitter followers 13,286. India | US About Blog ZNetLive is an end-to-end web services provider for individuals, SMBs and enterprises with services ranging from domain names and web hosting, cloud VPS and dedicated servers and up to multiple cloud platforms. ZNetLive blog brings you the latest news and information from about web hosting, VPS, dedicated servers, domain names, WordPress hosting, SEO and many more. Facebook fans 22,566. Twitter followers 1,166. About Blog Find helpful articles to advertise your small business for improved sales and marketing with print and digital products. Facebook fans 183,664. Twitter followers 26,490. Portland, ME About Blog A global community of accounting professionals designed to connect industry experts and advance knowledge of the latest accounting trends. Facebook fans 1,777. Twitter followers 8,463. Chicago, IL About Blog Nerdio is IT-as-a-Service (or ITaaS), which is virtual desktops, hardware, software, security, and 24/7 support. Virtual desktop infrastructure (VDI) at the core of an IT-as-a-Service (ITaaS) platform. Completely managed IT for MSPs or SMBs in any industry. Facebook fans 3,263. Twitter followers 922. Facebook fans 789. Twitter followers 910. New Delhi, India About Blog Cash Suvidha is a trade name of Usha Financial with an aim to uplift the families who do not have access to banking services as well as SMEs. Cash Suvidha gives a chance to such families and SMEs to meet their financial needs, who find it difficult to get finance due to inflexible guarantee parameters, obstructive lending policies or lengthy disbursement. Facebook fans 25,981. Twitter followers 598. Albuquerque, NM About Blog Law 4 Small Business (L4SB) is law firm created especially to help small and medium sized businesses cope with routine legal issues, without spending a fortune. Facebook fans 419. Twitter followers 218. Houston, Texas About Blog SalesNexus helps businesses grow by making marketing and selling easier, more focused on human connection and less stressful. Facebook fans 5,322. Twitter followers 5,505. Oakville, Ontario About Blog HostPapa's goal is to provide individuals and small to medium-sized businesses with a fully-featured shared, reseller, or VPS hosting solution. Here you’ll find all sorts of super useful information for making the most out of your web hosting experience as well as countless tips and tricks for small business owners, freelancers, digital professionals and online entrepreneurs. Facebook fans 28,057. Twitter followers 35,134. Dublin, Ireland About Blog ISME, the Irish Small and Medium Enterprises Association, is the only independent representative association for Small and Medium Enterprises and currently has in excess of 10,500 members nationwide. Uniquely in Ireland, ISME is independent of big business, big banks and government and gives voice to the issues facing SME owner-managers. Facebook fans 941. Twitter followers 7,496. Strasbourg, London, Chicago About Blog The KEXINO Marketing Blog provides thoughts, opinion, tips, and Marketing, content creation and communications services for startups & small businesses designed to build awareness, reputation, trust - and sales. Facebook fans 434. Twitter followers 3,675. Bangalore, Karnataka About Blog It was in 2009 the story of Maple CRM has started. Its the time in India when Cloud means just cloud and the Cloud Applications were meaningful only to enterprise companies. Maple CRM has built the application mainly focussing on Small & Medium corporates who understands the advatages of SaaS applications but unable to migrate to one of them due to cost and complexity reasons. Facebook fans 1,401. Twitter followers 25. Dubai About Blog SME Advisor Middle East is aimed at business owners and senior executives across the GCC. Armed with practical advice, it has been highlighting key business issues for the small and medium enterprise segment since its launch in 2005. Facebook fans n/a. Twitter followers 6,015. Fort Wayne, Indiana About Blog At Summit CPA, we offer virtual CFO and 401k audit services to small and medium-size businesses who aren't ready to hire a full-time CFO but can benefit from strong, experience-driven processes. Our mission is to help clients maximize profits, minimize taxes, and build personal wealth. Facebook fans n/a. Twitter followers 580. Australia About Blog Australia's #1 Accounts Receivable Software for small and medium businesses. EzyCollect accounts receivable software helps companies to streamline, automate and better manage customer credit and collection activities. The outcome is improved cash flow, a reduction in your bad debt write-off's, improved profitability and more free time for you to enjoy life! Facebook fans 624. Twitter followers 875. USA About Blog Small business technology news and insights from Panasonic. Learn about the latest technologies and trends for small businesses. Facebook fans 51,825. Twitter followers 1,054. Massachusetts About Blog SMB Group is a technology industry research, analysis and consulting firm focused on technology adoption and trends in the small and medium business (SMB) market. Founded in 2008, we help our clients to: - Identify market trends and opportunities - Understand and segment the SMB market - Evaluate and act upon market opportunities, competitive threats and disruptive trends. Facebook fans 198. Twitter followers 4,086. Facebook fans n/a. Twitter followers 5,643. 38. Generate Accounting | Ponsonby Accountants. Auckland, NZ About Blog We absolutely love what we do. We love to help small to medium business overachieve their goals. We come from successful commercial backgrounds and we know how to grow companies by building sustainable revenue, not just managing costs. We are Xero gold partners and pride ourselves on our knowledge of cloud computing solutions. Facebook fans 94. Twitter followers 260. Sydney Australia About Blog G2m Solutions is the leading inbound digital marketing agency in Australia. It builds lead generation engines for Australian firms, particularly small & medium businesses who focus on B2B. Its Mission is to help Australian small and medium businesses by combining great experience with great IP and great partners. Facebook fans 173. Twitter followers 1,204. Facebook fans 287. Twitter followers 817. Australia About Blog CommTogether offers 'information, communications, marketing'. Based on extensive unique experience working with individuals, small business, corporates and the not-for-profit sector, CommTogether's professional and efficient quality service uses relationships it establishes and maintains to build strategic foundations and deliver outcomes that will make a difference, Contact CommTogether today. Facebook fans 153. Twitter followers 1,942. Fort Collins, CO About Blog This blog is meant to be a resource to all small and medium sized business owners. This is the AllProWebTools online marketing blog. AllProWebTools is a small business software that is an all in one solution for your business. Facebook fans 375. Twitter followers 869. Irving, Texas About Blog SMB Suite is a fully integrated suite of business applications built on the Microsoft Dynamics platform. With SMB Suite your small or midsize business can manage all of your operations including: Financial Accounting, Sales and Marketing, Customer Care & CRM, Business Reporting & Forecasting Dashboards-Human Resources. Facebook fans 107. Twitter followers 465. High Fells in Cumbria About Blog Smart technology for smarter small businesses. The Tech Savvy SMB has grown out of the ashes of Web2 and More, an online resource for SMBs that was started about four years ago and reached a Google Page Rank 4 status before the plug was pulled. Facebook fans n/a. Twitter followers 1,379. About Blog AMI-Partners is a home for entrepreneurs of thought. Problem solving, idea generation, and the ability to develop answers and action are the hallmarks of who we are. Small and medium business experts with actionable market intelligence and business ready insights to empower businesses. Facebook fans 70. Twitter followers 1,075. Ottawa, Ontario About Blog Business Sherpa Group (BSG) is a management consulting firm specializing in providing embedded business services to small and mid-sized enterprises (SMEs). BSG consultants are independent contractors and business owners in their own right who understand the unique challenges facing SMEs. Facebook fans 57. Twitter followers 748. Oceanside, California About Blog Our passion is helping small and medium sized businesses succeed online. Marketing can be complex. It changes constantly. Yet, for the small business owner, online marketing is essential. After working with hundreds of local businesses, we’ve created tools, courses and services packages to suit your business goals and budget. Facebook fans 554. Twitter followers 311. London, England About Blog Promote the values and principles of the Labour Party to the small & medium enterprise businesses community in Britain. Through Small Medium Enterprises (SMEs) for Labour, we want to provide a forum whereby SMEs can work in partnership with the Labour Party and continue to inform our economic policies. Facebook fans 620. Twitter followers 2,505. Alloa, Falkirk, Stirling About Blog Services was set up by Mark Stewart to provide small and medium sized businesses with sound accounting, bookkeeping and taxation advice so you can concentrate on developing your business. Find blogs on accounting, bookkeeping, taxation, VAT, social media. Facebook fans 151. Twitter followers 480. Johannesburg, South Africa About Blog KBA Africa is a Pan-African Business Advisory, Incubation and Capacity building organization specializing in accelerating the growth of Start-ups and early stage Small and Medium Enterprises. Facebook fans 76. Twitter followers 171. Rome, Italy About Blog INSME (International Network for Small and Medium Enterprises) is a private non-for profit association based in Rome comprising members from 40 different countries. The network encourages and facilitates transnational cooperation among innovation stakeholders worldwide, with a view to fostering SMEs’ access to existing knowledge. Facebook fans n/a. Twitter followers 1,127. Lancashire, UK About Blog A family run firm of Award Winning professionally qualified accountants, business and tax advisers who through the use of cloud technology are already advising and supporting clients throughout the UK. Our clients are not the big business type, but they are the every day smaller and medium sized businesses of sole traders, partnerships between relatives or friends, etc. Facebook fans n/a. Twitter followers 2,927. Redmond, WA, USA About Blog Microsoft is dedicated to helping people and businesses worldwide realize their full potential. No matter what your vision for the future of your business looks like, Microsoft in Business wants to help you get there. Whether it’s running your business more effectively or just finding the right advice, services, or products, we’re committed to your success. Facebook fans 379,407. Twitter followers 8,380,178. San Francisco, CA About Blog Chime is a marketing and customer relationship management (CRM) suite designed for small and midsize real estate businesses. Chime provides team management features, lead and customer management and content management. Facebook fans 2,429. Twitter followers 15,038. About Blog I help owners of small and medium sized businesses to create differentiate which sets their businesses apart from the competition in ways that matter to the customers. I provide business strategy coaching, consultancy and mentoring based on what you need to move your business forward successfully. India About Blog 31West Global Services is a leading outsourcing company providing superior technical support & help desk services to small and medium companies globally. Facebook fans 167. Twitter followers 887. About Blog Blogging about small business, working from home, self-employed, contractors, business start-up using online eco-friendly software combined with bootstrapping techniques and social networking. Facebook fans 16,333. Twitter followers 3,324. Australia About Blog Follow our blog for the latest news and updates in regards to the online accounting for small or medium sized businesses. Facebook fans n/a. Twitter followers 333. About Blog At Jelf Small Business, we offer a refreshing approach to small business insurance. And we have an expert UK-based team that makes everything happen. They’re real people who take the complexity out of insurance so you know exactly what it offers and what it will cost. Facebook fans 338. Twitter followers 2,414. Nashville, TN About Blog This is a place for anyone wanting to provide better customer service. The site is mainly geared for those working in small to medium technical service centers, there will be something for everyone. Facebook fans n/a. Twitter followers 4,866. Melbourne, Australia About Blog Discover how theBankDoctor's free small business banking and finance advice helps owners get the best business banking set-up. A Not For Profit helping SMEs better understand & deal with the challenges of funding a small business. Facebook fans 75. Twitter followers 829. Johannesburg, South Africa About Blog CompuDynamics South Africa provides both Computer Products and Services to Small, Medium and Large Enterprises. Our main offices are based in Edenvale and Cape Town, and are able to provide total I.T. Solutions in most parts of South Africa. We aim to be one the best IT Service company in the industry for SME's..
Facebook fans 2,180. Twitter followers 157. NAIROBI About Blog Small Medium Enterprises Today is one of the leading business magazine published in Kenya. It's the most exciting and authoritative info-pack on entrepreneurship. Facebook fans n/a. Twitter followers 350. Facebook fans 757. Twitter followers 201,086. Stamford UK About Blog I understand that running a small business can be lonely. You work long hours to realise your dream but don’t have anyone to turn to for advice or to discuss your plans. I would offer small business owners a thorough business review, a clear action plan and on-going support to implement that action plan. Honest advice from someone who has spent their whole life working in small business. Facebook fans 14. Twitter followers 909. About Blog Small Biz Club is the premier destination for small business owners and entrepreneurs. We bring you the best of the best-insightful thinking on important business questions from industry leaders, veteran business owners, and fellow entrepreneurs. Facebook fans 5,260. Twitter followers 2,778. About - Founded in 2003, Small Business Trends is an award-winning online publication for small business owners, entrepreneurs and the people who interact with them. It is one of the most popular independent small business publications on the web. Small Business Trends brings original news, information and resources to entrepreneurs, owners and managers. About - Small Biz Club is the premier destination for small business owners and entrepreneurs. We bring you the best of the best—insightful thinking on important business questions from industry leaders, veteran business owners, and fellow entrepreneurs. About - UpCity’s inbound marketing blog provides weekly & monthly news, guides, and educational resources on a variety of topics that influence SMB digital marketing. About - SMB Group is a technology industry research, analysis and consulting firm focused on technology adoption and trends in the small and medium business (SMB) market. About - SME brings you news stories, features and expert blogs examining the key issues affecting your small or medium-sized business. About - SmallBusiness.co.uk provides useful resources and services for small business owners and start-ups. We offer free online advice in the form of news articles, guides, tips and features and a Q&A Forum to ask questions to our panel of experts. Get expert knowledge and support to help develop your ideas and achieve success. About - Business Matters, the UK's largest business magazine for the entrepreneur, start-up and small and medium-enterprise (SME). Get Business news, advice & interviews. About - Welcome to our business blog. We provide small and medium-sized organizations with a range of easy-to-use, secure, and efficient business management software and service from accounting and payroll to enterprise resource planning, customer relationship management, and payments. Sage Advice UK provides the best advice on everything from managing money to people. About - Our philosophy is to be transparent; in the way we do things, the way we track and measure results, in the way we select clients, the way we show our successes or near misses and, in the way we explain our pricing. About - SME Strategy was founded in 2011 to help small and medium sized enterprises (SMEs) create and fulfill their strategic plans. We do that by facilitating strategic planning meetings, providing expert advice to senior leaders, and by making strategic management frameworks easy to understand and easy to access. About - Business Sherpa Group (BSG) is a management consulting firm specializing in providing embedded business services to small and mid-sized enterprises (SMEs). BSG consultants are independent contractors and business owners in their own right who understand the unique challenges facing SMEs. About - My Business is Australia’s pre-eminent digital platform dedicated to equipping ambitious small to medium enterprise business owners with the knowledge and inspiration they need to grow their business. My Business provides innovative business strategies, practical tips and expert advice that Australian SME owners can use in their day-to-day operations. About - Accrutus Capital established in 2007, provides alternative capital solutions for Australian small businesses. We offer a holistic funding approach with unsecured products for working capital and unsecured business loans and merchant cash advance that support growth. Our short-term collateral loans enable urgent funding for development and acquisition. We understand each business structure is unique and the issues owners face to fund the company’s growth. About - Kochie’s Business Builders is Australia’s number one destination for small business news, resources, features and inspiration. About - Keep current with the latest news, trends and developments in the world of small business with Inside Small Business. About - SME Joinup is India’s largest Business Services Helpline for Small Businesses. It boasts of 1 lac+ SMEs in its network who have interacted with SMEJOINUP for their service requirements. About - Despite running healthy growing businesses, entrepreneurs in India consistently struggle to raise timely credit from banks. Capital Float is an online platform that provides working capital finance to SMEs in India. We offer flexible, short-term loans that can be used to purchase inventory, service new orders or optimize cash cycles. About - We believe that small businesses are the backbone of any economy and fuel of growth and innovation in a country. SMEcorner's mission is to fill India's SME lending gap with the use of a proprietary online platform that combines machine learning, data science and artificial intelligence in a safe environment. About - With an urge to serve the much-needed service to the Indian SMEs, SMEStreet.in is created to become a dynamic knowledge sharing platform for SMEs. A platform on which SMEs can not only expect valued content for their business growth but also network with experts who can guide them to achieve growth. 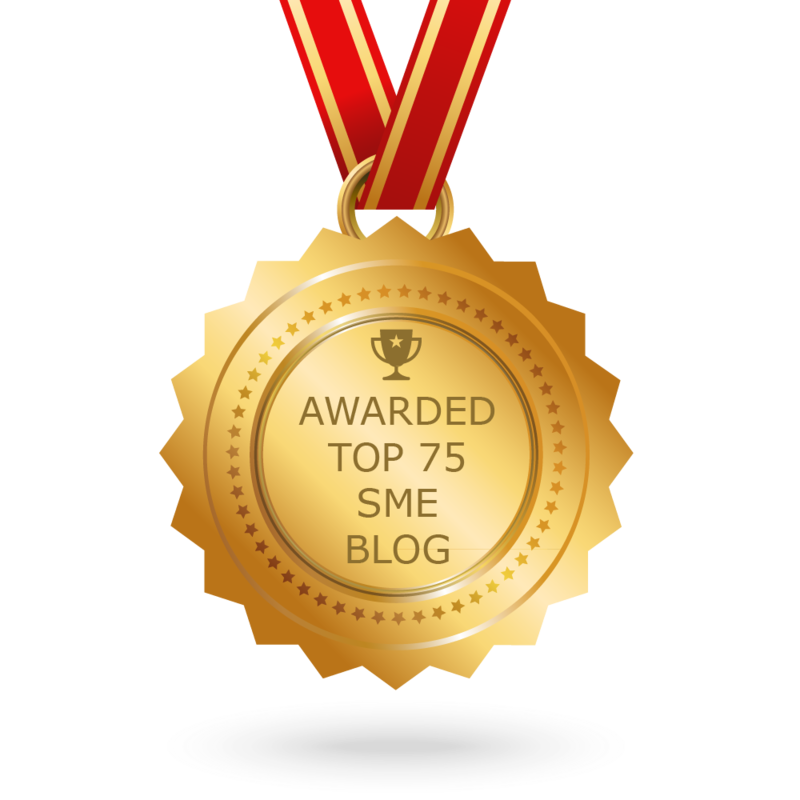 CONGRATULATIONS to every blogger that has made this Top SME Blogs list! This is the most comprehensive list of best SME blogs on the internet and I’m honoured to have you as part of this! I personally give you a high-five and want to thank you for your contribution to this world.